U2 is kicking off their second U.S. leg of the 360° tour in Denver and my plane for the mile-high city leaves in about five hours. Here’s a peek inside my suitcase before I catch a few hours of sleep to last me through the next few days of excitement, exhilaration, exhaustion. The orange microlite sleeping bag and gray Therma-rest are small enough to fit into checked baggage and still have room for clothes, and will make the GA line a little more comfortable should camping out be required. Two pairs of jeans (OK, I’m lying … three), one hoodie (OK, two) and a long-sleeve T-shirt to accommodate the 40°/70° temperature range in Denver. 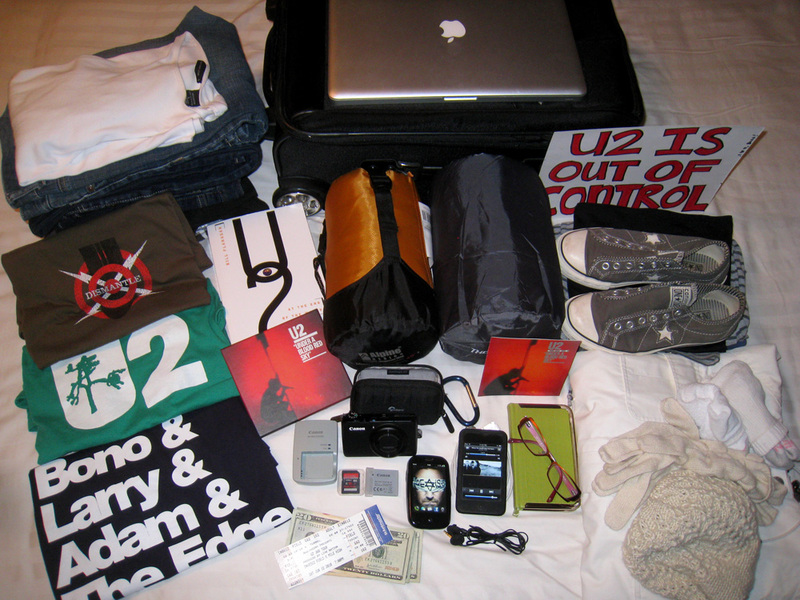 Three U2 shirts, as I have yet to decide which one I’ll wear to the show (yes, I’m that guy). U2 At the End of the World, by Bill Flanagan. An essential read for U2 fans that I’m still working my way through. Under a Blood Red Sky dvd. U2 played the historic Red Rocks concert June 5, 1983, and the amphitheater is just 20 minutes from downtown Denver. Hoping to check it out on this trip and want to study up on it before I go. The jewel case insert from my Under a Blood Red Sky cd, which is this trip’s designated Bono-autograph piece, should the opportunity arise. My Chucks, perfect for both GA line lounging and sprinting to the front rail once they open the gates before the show. iPod, loaded to the rim with nothing but U2 — studio albums, live performances and b-sides. Canon PowerShot S95, which I bought based on great feedback about its low-light performance at concerts. Hoping to come back with some awesome shots. Also, a charger, a spare battery and a 16 GB memory card. A sturdy Lowepro camera case attached to a carabiner, which I’ll clip onto a belt loop so I won’t have to take a bag into the concert — this will substantially decrease my security-frisking time and get me to the pit sooner. 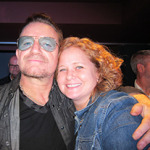 Glasses, which I don’t usually wear, except my night vision is awful, and I can’t risk a blurry Bono. My little green journal, for bethandbono.com inspirations. My “U2 IS OUT OF CONTROL” sign. Had it with me at the 2009 Charlottesville show. Hoping Bono will spot it again, but follow the instructions this time and play it! Cell phone, which will either die or not get any service in the stadium, but I’ll still try to get some pics and tweets out. My GA ticket! I didn’t consider going to Denver until long after GA tickets were sold out. I lucked out with a good, honest Craiglist connection and got the ticket for even less than face value.